Private tour with the Director of the Nubian Museum where the Director of the Museum and a visit to a Nubian village enjoying tea in one of their homes. Visits to the Temples of Dendera and Abydos. Visits to several art galleries and the Modern Art Museum. Visits to the Great Pyramids, the Sphinx, Memphis, Saqqara, and the Cairo Museum. Some special visits include a visit the Nubian Museum where the Director will give us a private tour and a talk about the history and heritage of Nubia. Nubia sits between Aswan in Egypt and Khartoum in Sudan. The Director will take us to visit to a Nubian village where we will meet with the Nubians and will enjoy tea in one of their homes. At the Khan El Khalili Bazaar, our small group allows us to visit several intimate factories, (often one room), to see and learn about Egyptian handiwork and crafts from the artisans. In Cairo we will visit the galleries of famous Egyptian artists including painters, sculpture and photographers. The tour is for 8-16 travelers only, so you can enjoy the company of others, or fill the trip with your friends and/or family. Our small group size provides you with special opportunities and private access for unique cultural experiences. Arrive in evening in Cairo and head to our hotel. Dinner is on our own. Today we have a full day tour to Old Cairo (Misr al Qadima), rich in the history of Christianity. The tour will include visits to major Islamic and Coptic sights including the Mosque of Ibn Tulon, built in 879 AD entirely of mud brick and one of the oldest and largest mosque in Egypt; The Hanging Church, dedicated to the Virgin Mary, it got its name from the Arabic Al-Muallaqa meaning “suspended” as it was built over the Water gate of an old Roman fortress; The Coptic Museum, with rare collections of Coptic art, considered the best in the world and the Ben Ezra Synagogue, Egypt’s oldest synagogue dating back to the time of the Old Testament. Lunch will be at a local Egyptian Restaurant followed by a tour to the most fascinating part of Cairo. The City of the Dead is a cemetery which encompasses 4 square miles and full of tombs and mausoleums and living people. Caretakers of the mausoleums and their families as well as the families of the dead moved here because Cairo was over crowded and because they wanted to live near their dead relatives. Many live in rooms of the mausoleums right over the tombs. Here we will meet a third generation glass blower in his narrow one room factory and storefront. It is believed that he has the last surviving glass-blowing workshop in Cairo. He began at 15 and has worked there for over sixty years. We will learn of his heritage and watch him work as he explains his craft. Three sons and a grandson now work with him. His wife and daughters also help…an unusual thing in their culture. They prepare the raw material used to make glass, prepare the kilns and help in the sales of the glassware. On to The Al-Rifa'i Mosque. King Farouk, Egypt’s last king, was buried here along with members of the Royal family. The Mosque was begun in 1869 and competed in 1912. Dinner tonight is on our own. Transfer from the hotel to the airport for a short flight to Luxor. We will be met and taken to our cruise ship which will be our home base for the next 7 nights. After lunch on board we will explore Luxor and have a tour of the Luxor Museum, a small museum of ancient Egyptian artwork, statues, and funerary pieces. We will visit the Temple of Luxor which sits along the banks of the Nile in the center of town. In the evening we will enjoy the Sound and Light Show at the Temple of Karnak, before returning to dinner and the night on board the ship. Today we will have an early morning visit to the West Bank. As we enter the West Bank we will see the Colossi of Memnon, two large statues which are monuments that once protected the tomb of Amenhotep III (mid 1300’s BC). 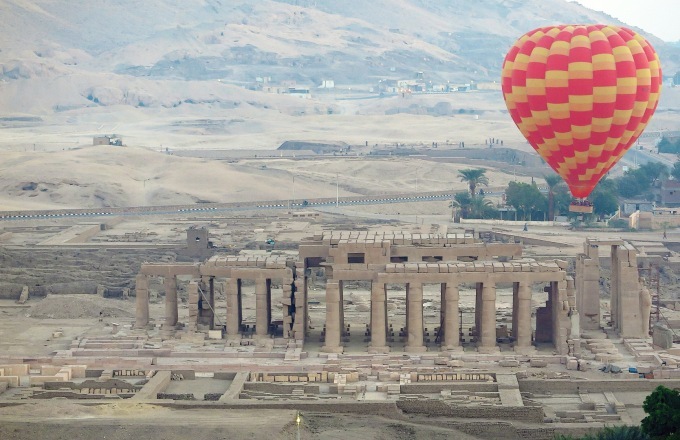 We will also visit Hatshepsut’s Temple. The temple sits at the base of a mountain and was the mortuary temple for Queen Hatsheput from the 18th dynasty. We will tour the Valley of the Kings and Queens, with over 60 tombs in just the Valley of the Kings alone. Built in the Theban Hills, pharaohs hoped that their hidden tombs would not be discovered by robbers and that all their wealthy possessions would go with them to the afterworld. Returning to the cruise ship for lunch we will start sailing towards the small farming community of Esna. On the way, we will go through the Lock at Esna which is a highlight in itself! Continue to sail to Edfu where we will be on board for dinner and overnight. Our day begins in Edfu to visit the Edfu Temple, the best preserved of all the temples of the Pharoahs. It was begun in 237 B.C and took 200 years to complete. From there we continue sailing to Kom Ombo and visit the temple dedicated to Sobek, the crocodile God and Haroeris, the winged God. We return to the ship after an interesting day and have dinner and the night on board. This morning we tour some of major sites in Aswan including the Unfinished Obelisk. This 125 foot long piece of granite sits in the quarry where it cracked while being cut. It would weigh about 1,190 tons if it were standing. On to the High Dam which was completed in 1971. It created a 300 mile-long lake displacing many Nubians. From here we go to the Temple of Philae, once an important place of pilgrimage. When the High Dam was built, the temple was moved stone by stone to a higher spot so it would not be submerged. We will return to the cruise ship for lunch. In the afternoon we will visit the Nubian Museum where the Director of the Museum will give us a private tour and a talk about the history and heritage of Nubia. Nubia sits between Aswan in Egypt and Khartoum in Sudan. The Director will take us to visit to a Nubian village where we will meet with the Nubians and will enjoy tea in one of their homes. Dinner and overnight will be on our ship. Today we relax on the cruise ship enjoying the sites and sounds of the Nile River. We pass feluccas (traditional Egyptian sail boats), fishing boats and many villages and farms. Both lunch and dinner will be served on board. We arrive in Luxor today and have free time to explore this city on our own. Fun places to explore are the Souks, the main Bazaar and the alabaster factories. Ancient Egyptian used alabaster to build their homes, tombs and temples. Our guide will help us with suggestions. Lunch and dinner will be served on our ship. Today we leave early to visit the Temples of Dendera and Abydos. Dendara is from pre-dynastic times. It was buried under sand before being rediscovered in the 19th centuryand is very well-preserved. The Temple of Abydos was built to honor Osiris, the God of the Dead. It was a pilgrimage place for all Egyptians who hoped to come here once during their lifetime. What can be seen today is a beautiful 19th Dynasty Temple of Seti 1. Today we will have both lunch and dinner on board our ship. This morning we fly back to Cairo and transfer to our hotel. In the afternoon we will have a private tour to meet and visit with several well-known Egyptian artists. We will also visit art galleries and enjoy the Modern Art Museum. Dinner is on our own. Today we have a full day tour visiting the Great Pyramids, the Sphinx, Memphis, which was the ancient Egyptian capital and Saqqara, its necropolis which is over 3,000 years old and full of archeological sites. We will enjoy local food for lunch and have time in Cairo to explore and have dinner on our own. Our last tour day in Egypt begins with a visit the Cairo Museum. From there we go to the Kahn El Khalili Bazaar. We will have a wonderful opportunity to visit several small factories (often one small room) to see and learn about Egyptian handiwork and crafts from the artisans. These include mother of pearl boxes and picture frames and beautiful brass plates. We will learn the history of their crafts and how many traditions are passed down from generation to generation. Tonight we will have a very special Farewell Dinner. Transfer to the Airport for your return flight home or a post trip to the Red Sea. All meals on the cruise ship and all meals as listed in the itinerary. Lunch and dinner will be served on the ship. Items not specifically mentioned above or in the itinerary.